2012 is just about over and it's time to reflect upon the year... Last year was the first time I did a "best-of" post and I really enjoyed it. This is the list of my favorite recipes for each month in 2012. I've challenged myself this past year to make many new things and have started to delve a little bit more into regional cuisines. 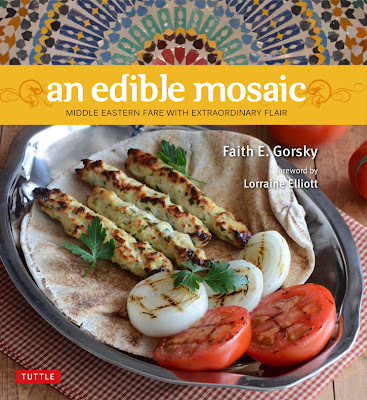 I'm excited to have received some great cookbooks for Christmas and am looking forward to all the new ingredients, recipes, and techniques I'm going to continue to learn in 2013. Thanks to everyone who takes to time to read and comment on my journey to learn more and more about food and cooking. Potato and cheddar pierogi: I chose these for January because it was the first time I ever made pierogi. It was a completely new technique for me and I enjoyed it a lot. Now I have made these same pierogis again and even one filled with kabocha squash. They are definitely worth the time and effort. Do you have a container of eggnog still hanging out in your refrigerator? Don't waste it - use it to make some pancakes! Readers of this blog know that I enjoy making pancakes and when I saw this post featuring eggnog pancakes I was kicking myself for not thinking of it on my own! We are lucky to have access to a really tasty eggnog from a local dairy farm that doesn't contain artificial flavors, high fructose corn syrup, and other nasty ingredients that lurk in many commercial eggnogs. I was going to make some homemade eggnog this Christmas, but never got around to it (next year!). When I see this yummy eggnog in the store, I always end up buying a few containers - probably more than we will drink - so this recipe is a great way to use up some (last year I made some eggnog glazed nutmeg cookies). These pancakes are perfect for a lazy snowy (we finally have snow!) weekend morning or New Year's brunch. They have a hint of eggnog flavor with cinnamon and nutmeg coming through. I used spelt flour, but you can use whole wheat or even all-purpose flour if that's what you have around. This recipe will make about 10-12 pancakes and serve about four people. I really love ginger, especially around the holidays. I always try to incorporate a ginger/spice type of cookie in my Christmas baking. I also try to include some sort of chocolate cookie. This year I went to a cookie swap and someone had made these cookies that combined ginger and chocolate. Needless to say, I really liked them a lot. She sent me the recipe, which came from The Sweet Chick. I put them on my baking list right away and finally made them. You are probably all finished with your Christmas cookie baking this year, but pin these for next year, especially if you are a fan of spice cookies. They are a very soft and moist cookie, with a nice crunch on the outside from the sugar. I adapted the recipe a little and it is below. It will make about three dozen cookies (perfect for a swap). Today is the Winter Solstice and, luckily, we are just starting to get our first real snow of the season. I suppose the Solstice is a good day for the snow to pick. To celebrate the first snow of the season, I've made some coconut snowballs. These little treats are simple to make and they don't require you to turn on your oven. They are full of coconut goodness. I found this recipe on The Kitchn and wanted to make it almost immediately. I changed the recipe to use honey instead of maple syrup, but otherwise kept it about the same. A lot of people were commenting that the recipe didn't work for them, or that they didn't get enough balls out the the mixture. I think that you have to be careful to get shredded coconut that is small like in the photo - not the longer strips that you often see in coconut desserts. These little balls are really delicious. I made 13 balls from my batch and will be making another batch before Christmas comes. Dates are something I love, but only usually find and eat around the holidays. This time of year I find packs of dried organic Medjool dates packed up in the produce section. They tend to be a bit pricey, but they are so sweet and chewy and completely delicious. What makes these little appetizers great is that the creamy goat cheese and the salty pistachios pair perfectly with the dates. The combination of all the flavors compliment each other so well and make the perfect one-bite snack. Pistachio and cardamom are such a great flavor pairing and I've been using it more and more lately. They are great to take to a holiday pot luck, work celebration, or put out as an appetizer for your holiday meal. They are easy and only require a few ingredients! I made these for the Veggie/Fruit a Month event that I am guest hosting this month. There's still plenty of time to participate and send my your date recipes! What's not to love about little fritters filled with root vegetables and/or tubers that are lightly fried until golden and crispy? In my world, absolutely nothing. Latkes are a shallow fried pancake, traditionally made with potatoes and are eaten during the Hanukkah season. However, there are many cultures that have some sort of potato pancake. This recipe doesn't include any potatoes, but rather features mild and slightly sweet celery root (celeriac) and mildly spicy parsnips. It is adapted from the parsnip latke recipe in Cook This Now by Melissa Clarke. I had a bag of parsnips already and we visited a winter farmers' market recently that had fresh lovely celery root that I couldn't resist. And, just in case that wasn't enough root vegetables (I think I've stated my love or root vegetables before), I added horseradish into the sour cream. Delicious. I also served them with some homemade applesauce. Also, December 9th is my THIRD blogging anniversary. I can't believe it. I'm still enjoying the process and the challenge of always trying out new foods and recipes. Most of all, I'm thankful to have "met" so many great people in the food blogging community. It really makes it all worthwhile and I enjoy reading all of your posts, viewing your photos, and being inspired by your creativity! Back to these latkes.... the below recipe will make about 15 to 18 or so latkes, depending on size. The weights of the roots are approximate, especially the celery root because I weighed it pre-peeling and you have to take off quite a bit. I ended up with about 4 cups of shredded celery root, parsnip, and onion combined (post-squeezing) - that should help you judge how much vegetable you'll need. My first cookie of the Christmas season has been baked! Plus, it was a new recipe for me. As a kid, I did not enjoy anise cookies at all - especially the ones made with seeds. But now, I love the flavor of anise and the idea of putting all the little tasty seeds inside my cookies. To me, it feels old-fashioned, and I like that. This year I was set on making a Christmas cookie that featured anise seeds. I used this recipe on the Penzeys Spices website as a guide. But, I wanted to add a little something else besides the anise seeds to provide more flavor. After some thought, I decided to incorporate some clementine zest into the cookies because I love fennel and citrus together and thought it would add a nice extra touch to the cookies. It definitely did add a nice fresh touch and another layer of holiday flavors. These cookies are pretty easy to make. You could probably frost them if you wanted, but I figure I'm going to be eating more than enough sugar this month. This recipe will make approximately three dozen cookies (if you are using about a 2-3 inch cookie cutter). It also makes dinners a little more difficult. Usually we are craving stews, soups, and other cold-weather dishes, but not so much when it is this warm. But, that's not going to stop me from making wintery meals. I'm hopeful that we will see some winter this year. It's still early..... and, I'm hopeful that we will have at least a covering of snow as we get closer to the holidays. This stew is a stick-to-your-bones kind of meal that is perfect for a cold evening. I've been wanting to make a version of this dish for quite a while and finally used this recipe to do so (I modified it slightly). The combination of ingredients sound strange -- the flavor is unlike anything I've eaten before, but after a couple bites, we both agreed that we liked it a lot! This dish will easily serve four hungry people. It's a simple dish to put together, but does take some time to simmer. It's a perfect stew to warm you up after coming in from the cold (if it's cold where you are). I'm happy to announce that this month I am guest host for Veggie/Fruit a Month. This is an event I've been meaning to participate in for about a year now, so hopefully this will kick-start my participation. I like when I'm challenged to create a dish featuring a fruit or vegetable. 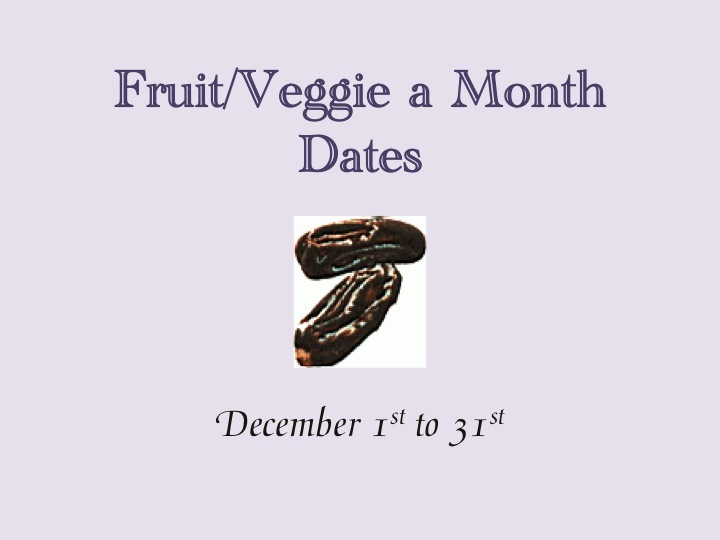 For this month, I've chosen dates -- just in time for the holidays!